Joe Charboneau was the American League Rookie of the Year in 1980. He had a batted .350 in single A ball in 1978, .352 in AA ball in 1979. In 1980 he skipped right over AAA to opening day starter in left field. He homered in his first ballgame. He continued to have success, hitting .289 with 23 homers, and received a 73 percent share of the R.O.Y. votes. His next 2 seasons would be plagued by back injuries. In the strike shortened 1981 season Joe hit a meager .210 and had back surgery following the season. 1982 was no better. He hit .214 in only 22 MLB games and underwent a second surgery. He never played another game in the Bigs. He holds the record for the fewest Major League games by a Rookie of the Year with only 201 games over 3 seasons. Like the Phillies, the White Sox also had 2 Rookie of the Year contenders on their roster in 1980. 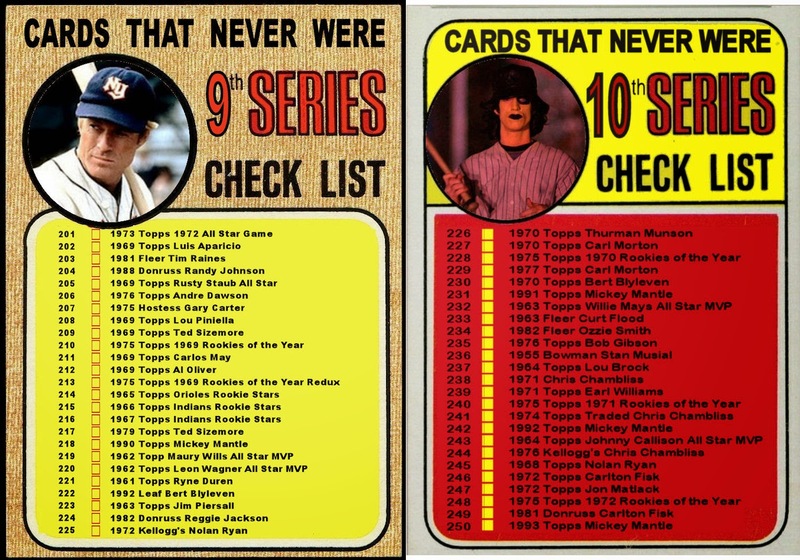 Also like the Phillies, neither were included in the 1980 set. 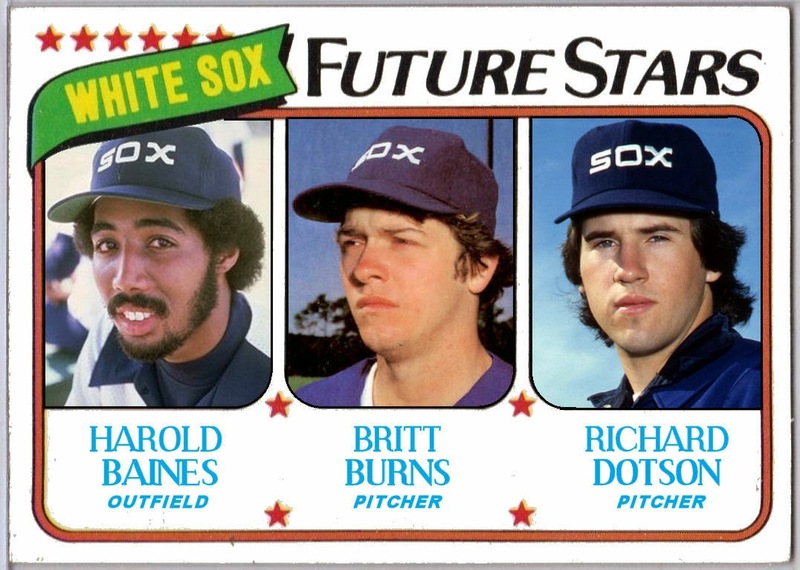 Britt Burns and Richard Dotson were the only pitchers on the White Sox staff with double digit victories. Burns' 15 wins and Dotson's 12 were good enough to earn 5th and 7th place in American League Rookie of the Year voting. 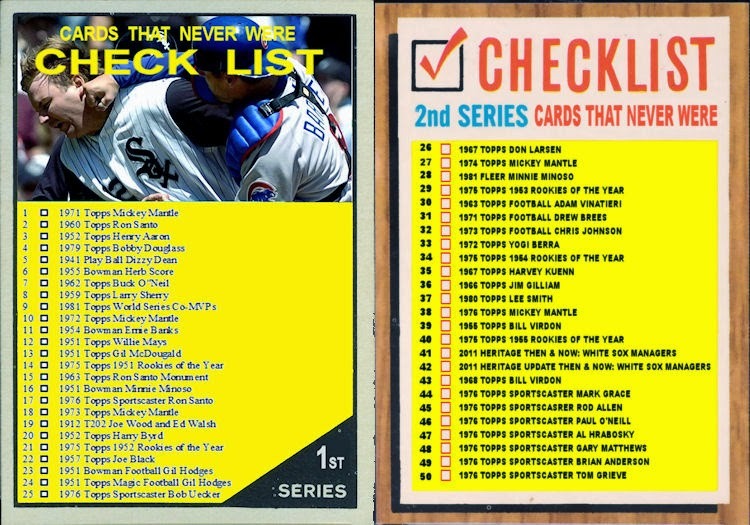 I added Harold Baines to this version of the White Sox Future Stars card. 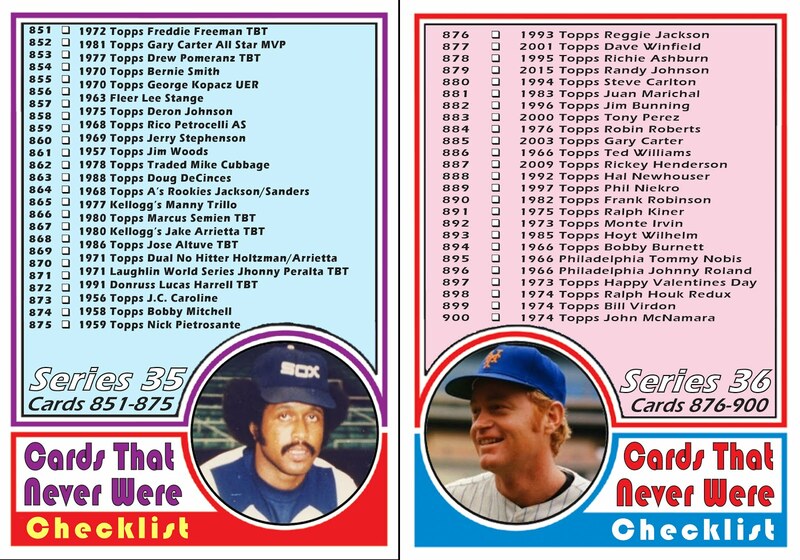 The #1 pick of the 1977 draft and 1980 opening day starter for the White Sox somehow didn't find himself on a Topps card until 1981. 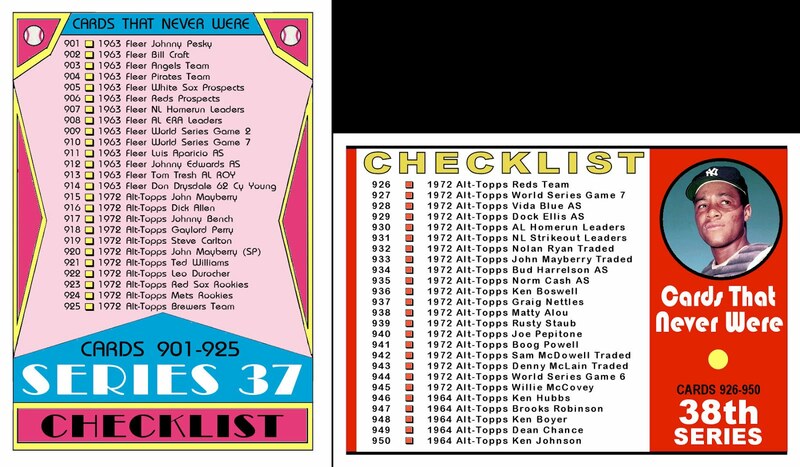 The three players on my version would continue to play for the Sox well into the 1980's and were all key parts of the "Winning Ugly" 1983 team. 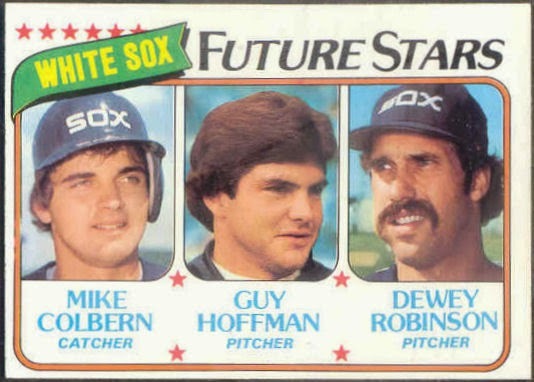 But this is what Topps thought the "Future" held for the White Sox. Colbern was the Sox' 3rd string catcher in 1979. He spent all of 1980 in the minors never making the big leagues again. Guy Hoffman and Dewey Robinson were both local boys, Hoffman was from Ottawa, IL and played ball for Bradley University in Peoria. Robinson was from Evanston and played ball for the Salukis at Southern Illinois University. Both bounced back and forth from minors to majors the next few years. Dewey Robinson moved on to coaching and Hoffman was in the Sox, Cubs, Reds and Rangers systems before moving to Japan to play the 1989-91 seasons. 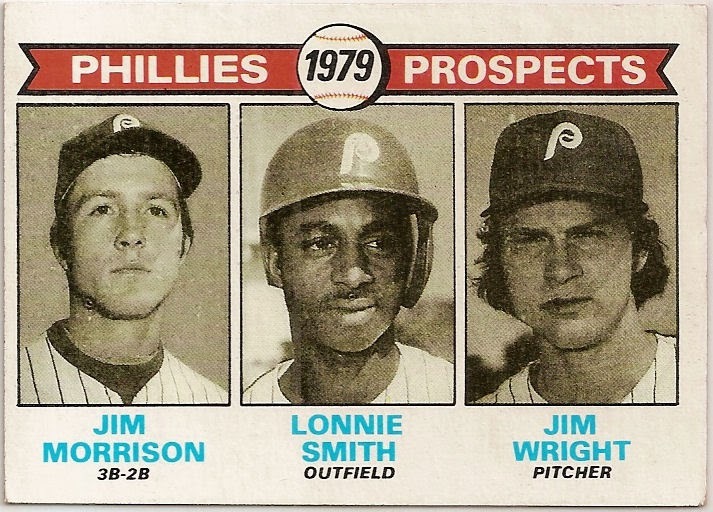 There were 2 Phillies players who received Rookie of the Year consideration in 1980. 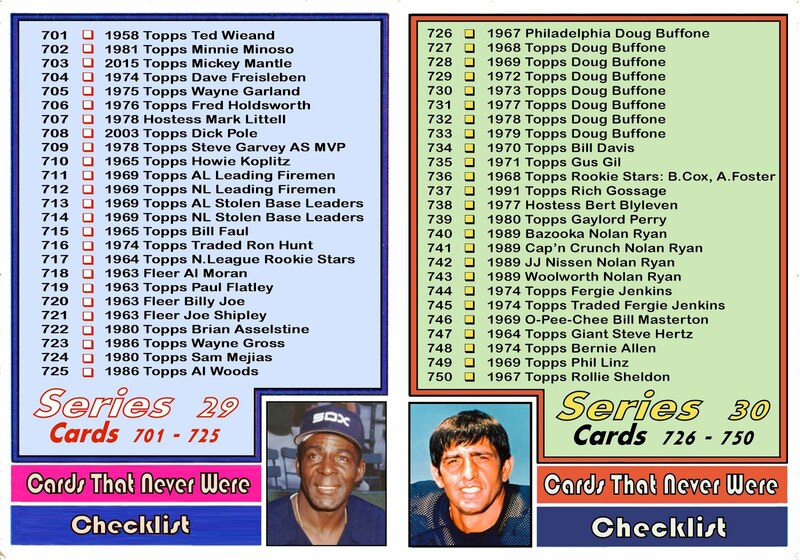 Of course neither of them were included in the 1980 Topps set so I decided to make a second Phillies Future Stars card. 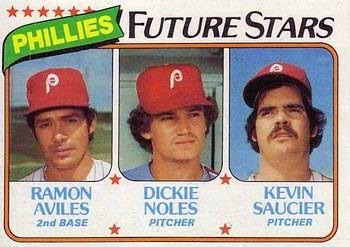 The original card featured Ramon Aviles, Dickie Noles and Kevin Saucier. Aviles saw limited action as a middle infielder but Noles and Saucier each had over 40 games in relief. 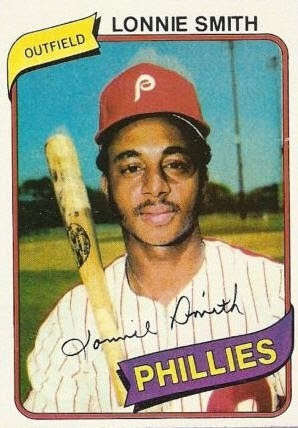 Lonnie Smith had appeared in the 1979 Topps set on a Phillies Prospects and he had a regional Burger King issue of him on a 1980 card but he was excluded from the regular issue set. He hit .339 and had 33 stolen bases for the Phillies and came in 3rd in Rookie of the Year voting. Bob Walk was one of 3 players who tied for 7th in the N.L. with one vote. He was 11-7 in his rookie season. 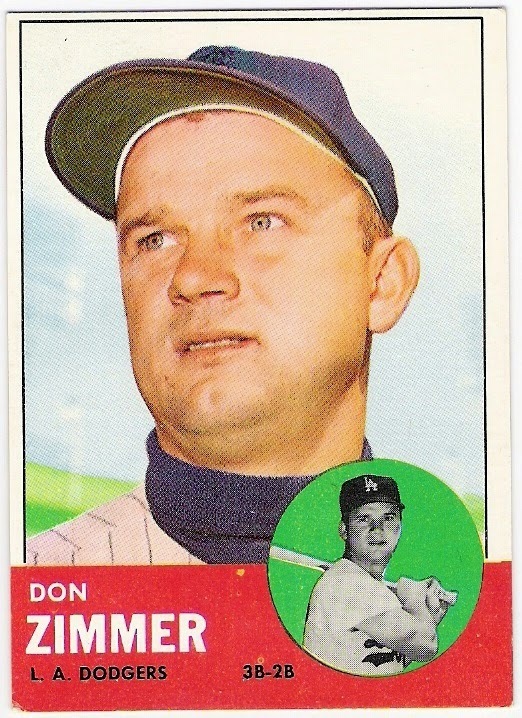 Bob Dernier made his Major League debut in September of 1980. I just added him to balance out the card. He would make his Topps debut in 1982 on a Phillies Future Stars card. 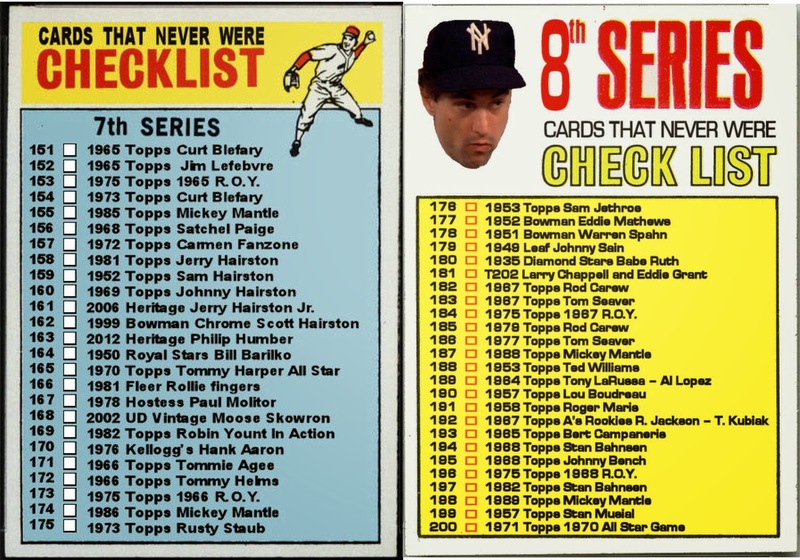 Dave Stapleton: I'm really not sure how Topps missed this one. Dave Stapleton was the 1979 International League MVP for the AAA Pawtucket Red Sox. He had a .321 batting average in 1980 and was 2nd in ROY voting in the American League. Stapleton spent most of his years in Boston as a utility infielder. In 1986 he was regularly used as a late inning defensive replacement for Bill Buckner who was nursing an ankle injury. Boston fans are still lamenting John McNamara's decision to leave Buckner in with a 2 run lead in the 10th inning of game 6. 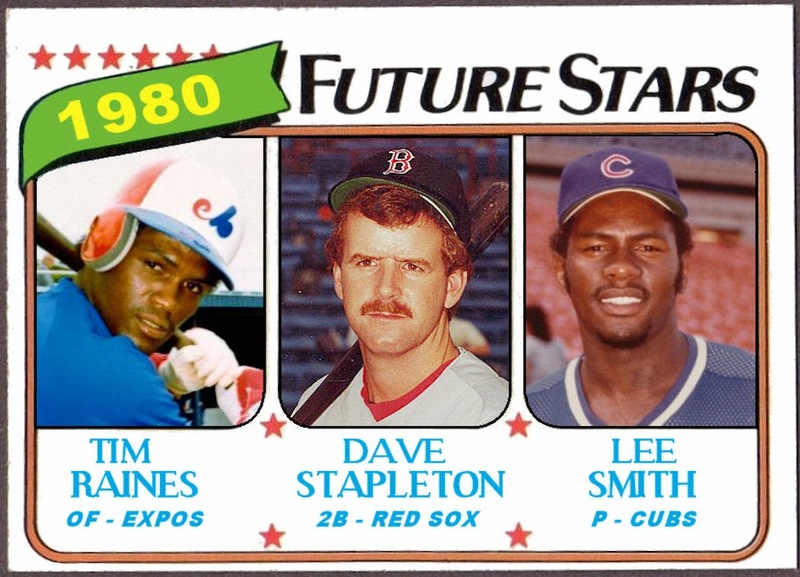 I included Tim Raines and Lee Smith on this card but really only Dave Stapleton received ROY votes in 1980. Raines was a September call up for the Expos in 1979 and saw limited playing time in 1980. He would get his first Topps card in the 1981 set. 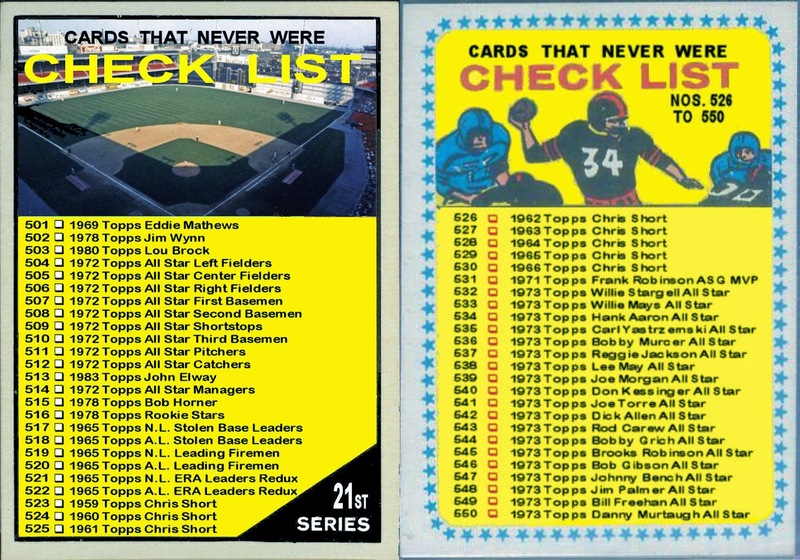 Lee Smith was 2-0 in 1980 but wouldn't appear on a Topps card until 1982. 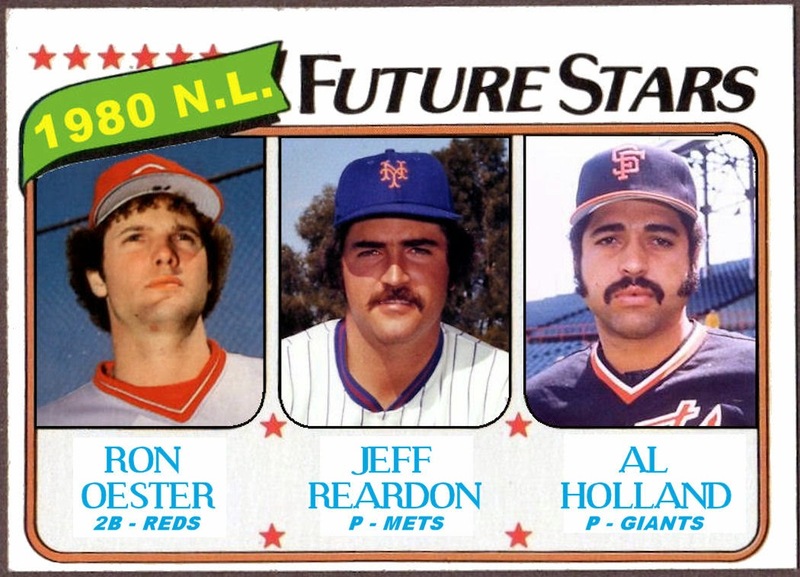 Ron Oester: Although Ron Oester was not included in the 1980 Topps Set he did have a "Prospects" card in the 1979 set. 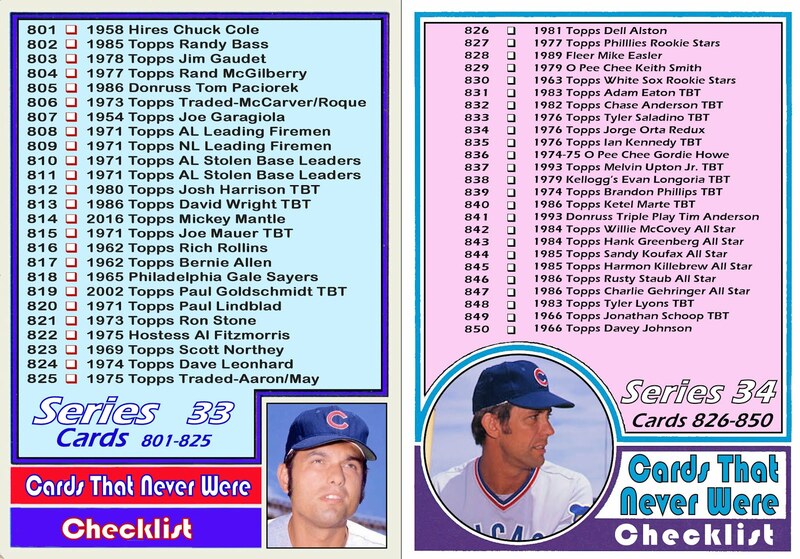 With Dave Concepcion at shortstop, I can understand why Topps didn't want to take another chance on Oester. 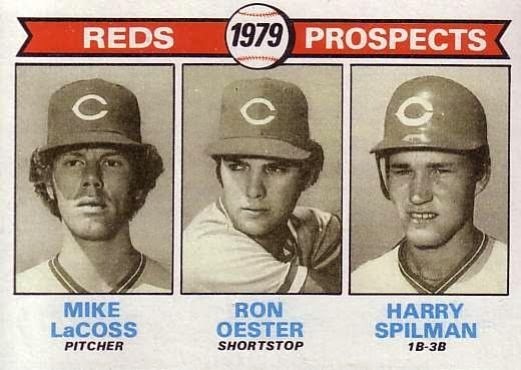 But the Reds found a place for him at 2nd base and Oester made the most of it. He played his entire 13 season career in a Reds uniform. Jeff Reardon: Reardon currently occupies 7th place on the All Time saves list with 367. But he wasn't the regular closer until he was traded to Montreal in 1981. Still his 101 strikeouts in 110.1 innings plus a record of 8 wins and 6 saves earned him a couple ROY votes. Al Holland: Holland also put together a solid year coming out of the bullpen. He was 5-3 with 7 saves. He was part of a 5 player trade that sent Joe Morgan to the Phillies in 1983. With the Phillies, Holland assumed the closer roll and made his only All Star appearance in 1984. 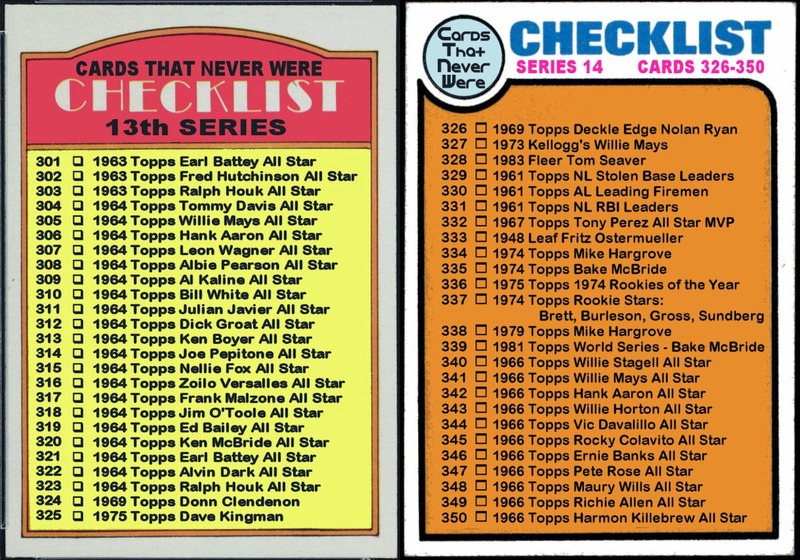 There were 16 different players receiving Rookie of the year votes in 1980 and not a single one of them was included in the 1980 Topps set. 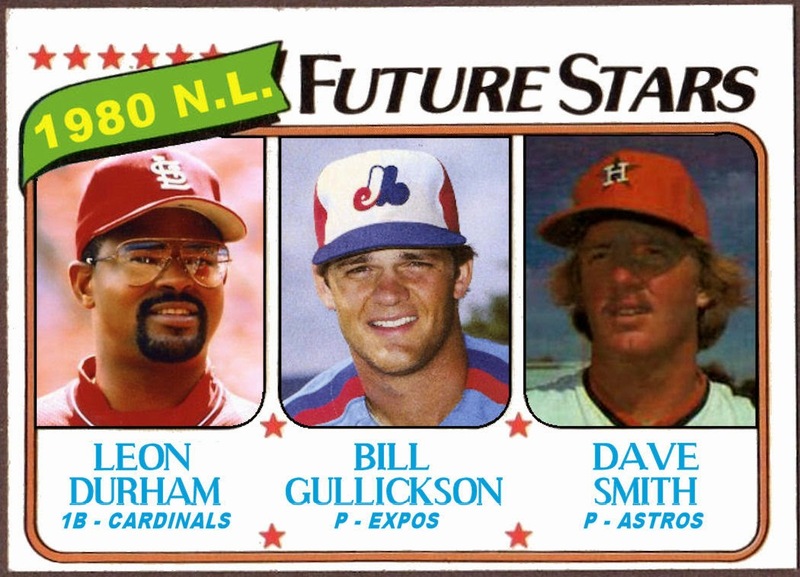 So I am continuing my flood of 1980 rookie cards. Here are 3 A.L. players. 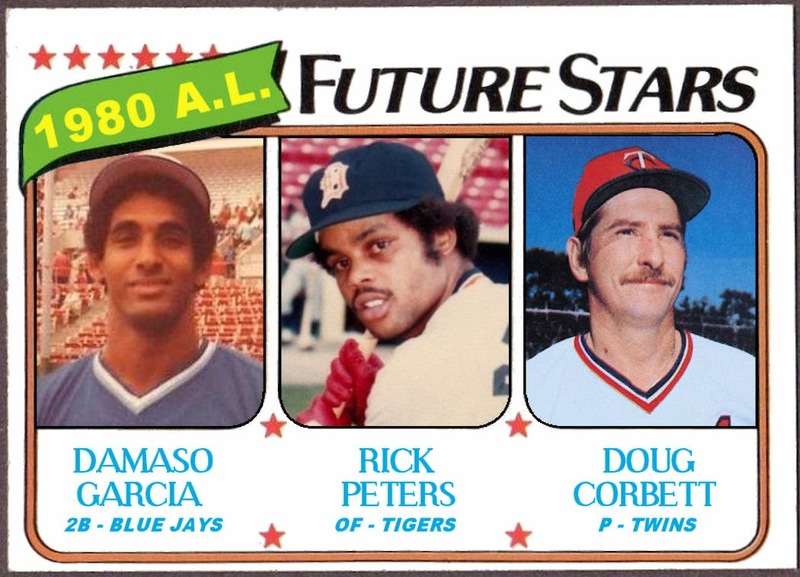 None of these players are household names but both Doug Corbett and Damaso Garcia were All Stars during the '80s. Damaso Garcia: Garcia saw limited action with the Yankees in both 1978 and 1979. 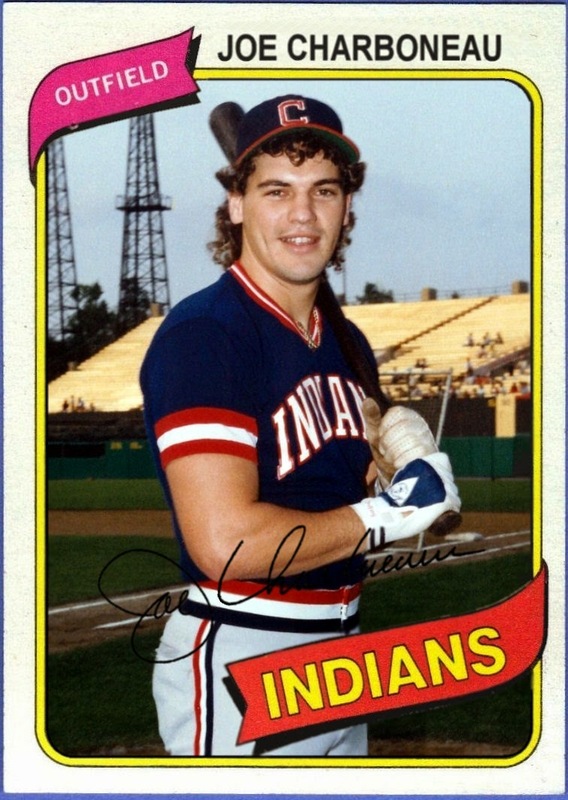 He was part of a 6 player trade in which the principle players were Rick Cerone and Chris Chambliss. 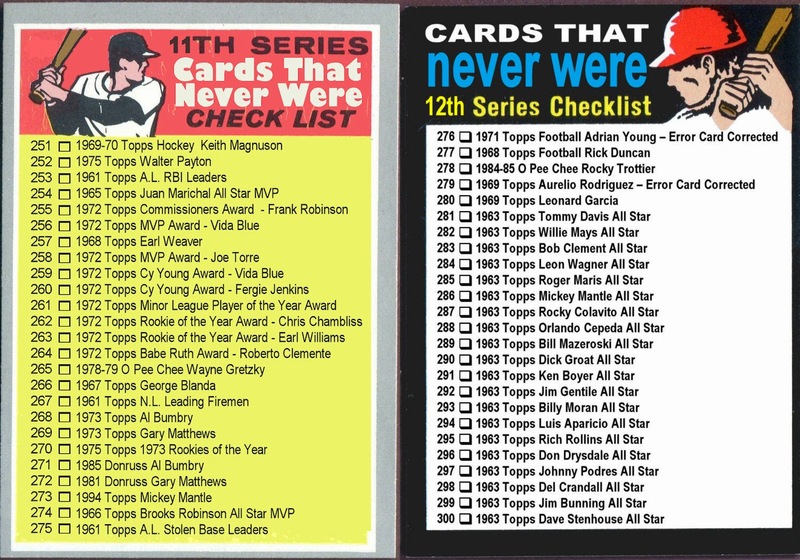 Garcia would play in 2 All Star games and win the Silver Slugger award while on the Blue Jays. He was 4th in R.O.Y. voting in 1980. Rick Peters: The switch hitting center fielder hit .291 as a rookie in 1980. His production fell in 1981 and he missed the entire 1982 season on the D.L. with an elbow injury.From 1983-1986 he was with the A's organization splitting time between the Major League club and their AAA club in Tacoma. He was 6th in R.O.Y. voting with a 2% share. Doug Corbett: With 8 wins and 23 saves in 1980 Doug Courbet was 3rd in R.O.Y. voting. In the strike shortened 1981 season he led the league in appearances and games finished. He was also the sole representative of the Minnesota Twins in the 1981 All Star Game. Unfortunately, he never saw action. In 1980 there were a total of 16 players receiving Rookie of the Year votes. 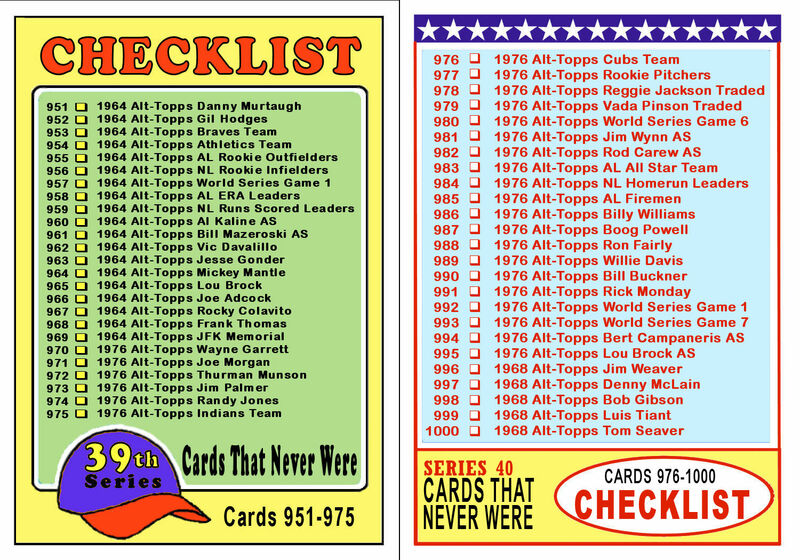 Guess how many of those 16 players were included in the 1980 Topps regular issue? Anybody?.... Bueller?.... Bueller? That's right. NONE. Zero, or in the spirit of the World Cup, nil. Granted, none of these players would set the league on fire. Most were fairly mediocre players. Still, 0 for 16 has to be some kind of record. Leon Durham: Leon played most of his minor and major league career at first base but with first base occupied by 1979 N.L. MVP Keith Hernandez. Durham spent most of 1980 in the outfield. At the end of the season he was dealt to the Cubs for Hall of Famer, Bruce Sutter. Durham was one of 3 players to receive a single Rookie of the Year vote. He was Tied for 7th in the N.L. with 1%. Bill Gullickson: In 1980 Gullickson set the record for strike outs in a single game by a rookie pitcher with 18. That record would later be broken by Kerry Wood in 1998 with 20 K's for the Cubs. Gullickson was 2nd in R.O.Y. voting with 44% of the vote. Dave Smith: In 1980 Smith had 7 wins and 10 saves to help the Astros to their first ever post season. Smith became the Astros all-time leader with 199 career saves until Billy Wagner surpassed him in 2003. Smith cam in 5th with an 11% share of the N.L. R.O.Y. votes. Another devastating loss was dealt to the sports world when Tony Gwynn succumbed to cancer Monday. 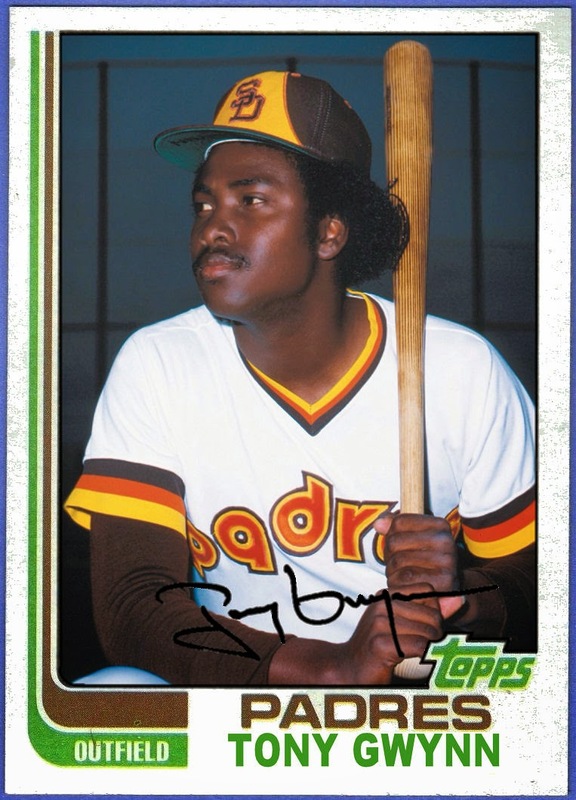 A native of Southern California, Gwynn played college ball at San Diego State and was taken by the Padres in the 3rd round of the 1981 draft. After 20 years on the same team, Gwynn returned to coach at his alma mater. Gwynn made his major league debut in July of 1982, hitting .289 in 54 games. An impressive stat for anybody except Tony Gwynn. His .289 rookie batting average was a career low for Gwynn who batted .338 lifetime and led the league in batting average 8 times. In fact he was one of the top ten hitters 15 of his 20 seasons in the majors. A legend of the NFL passed away on Friday, Chuck Noll died at the age of 82. The man behind the "Steel Curtain" guided the Steelers dynasty to 4 Super Bowl victories in 6 years. 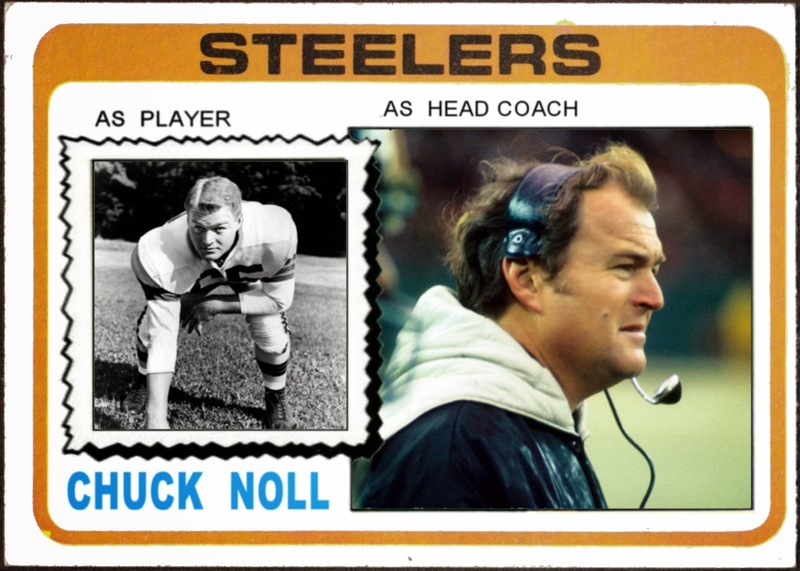 I couldn't decide whether to depict Noll as a player or head coach when creating a card in honor of this legend. 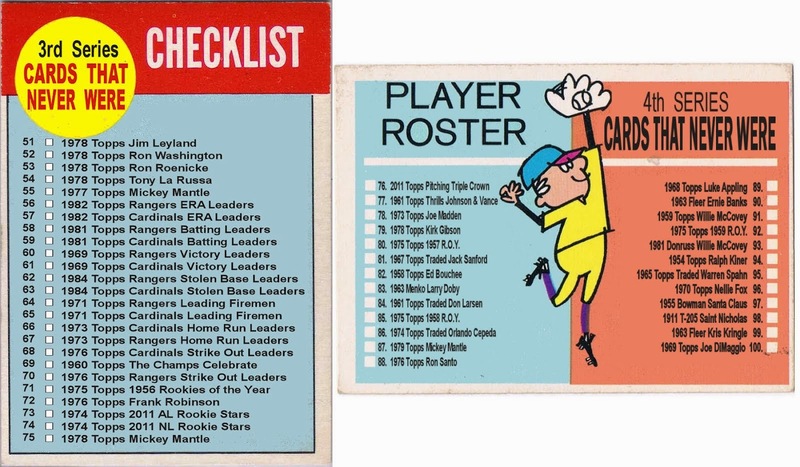 I eventually chose to incorporate the 1978 Topps baseball manager's format onto a 1978 Topps football card. This allowed me to showcase the man as both a player for the Cleveland Browns and as the head coach of the Pittsburgh Steelers. As a player Noll was used initially as a "messenger guard". He would alternate downs bringing in plays from the bench. After 7 years playing guard and linebacker for the Browns, Noll retired at the age of 27 to pursue a coaching job at his Alma Mater, the University of Dayton. He was passed over for that job but was given a job with the Los Angeles Chargers of the AFL. From 1960-68 Noll was a defensive coach for the Chargers then the Colts. In 1969 he was hired as head coach by the Pittsburgh Steelers. 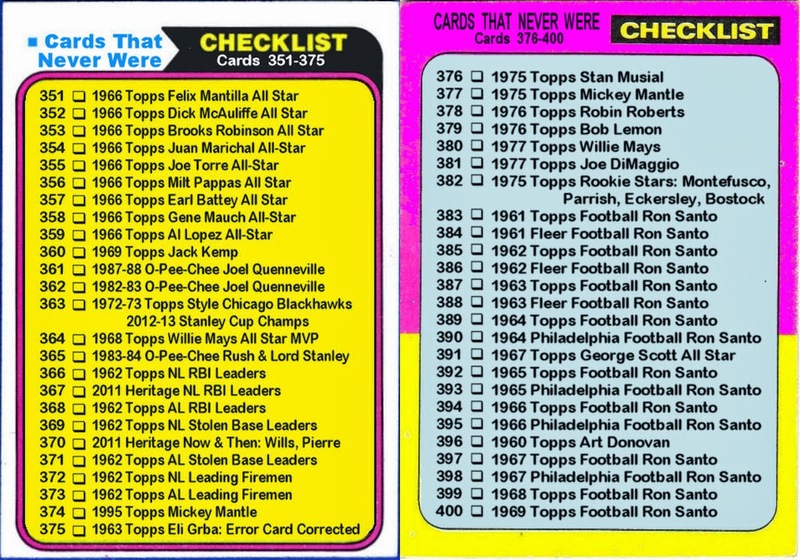 On the football side of Topps, rookie cards were seldom made for the player's actual rookie year. So making Cards That Never Were of the NFL Rookies of the year is kinda like shooting fish in a barrel. Boyd Dowler was used primarily as a quarterback in a single wing formation at Colorado. The formation they used would be similar to a wildcat formation today. Selected 25th in the draft by Green Bay, Dowler was made a flanker under Vince Lombardi in his first year as head coach. His 549 yards and 4 touchdowns was enough to earn the Rookie of the year award. 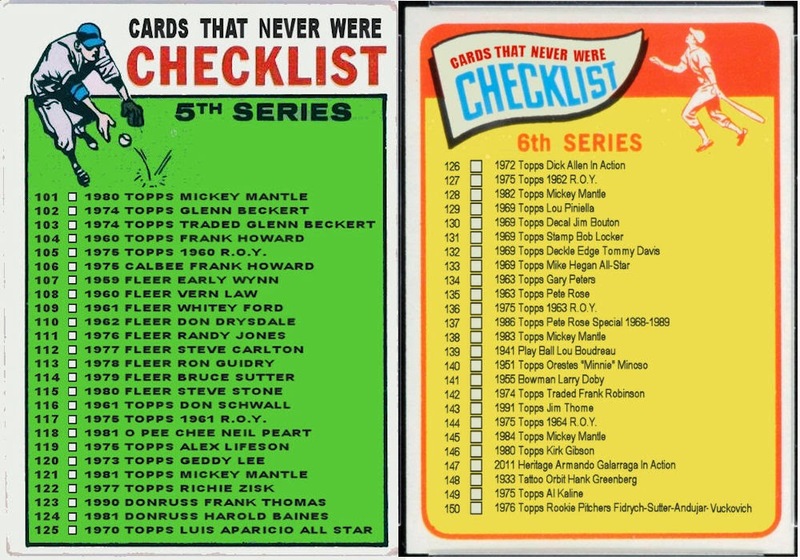 It appears as though Topps has ceased inserting Mickey Mantle cards into every set. 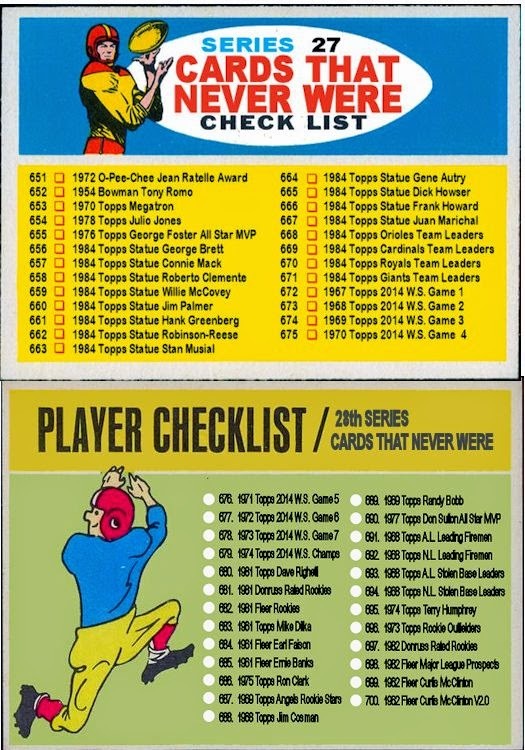 There is still no #7 card in the regular set. So here is another Mantle card to fill that void. Last week we lost one of the truly great baseball characters. 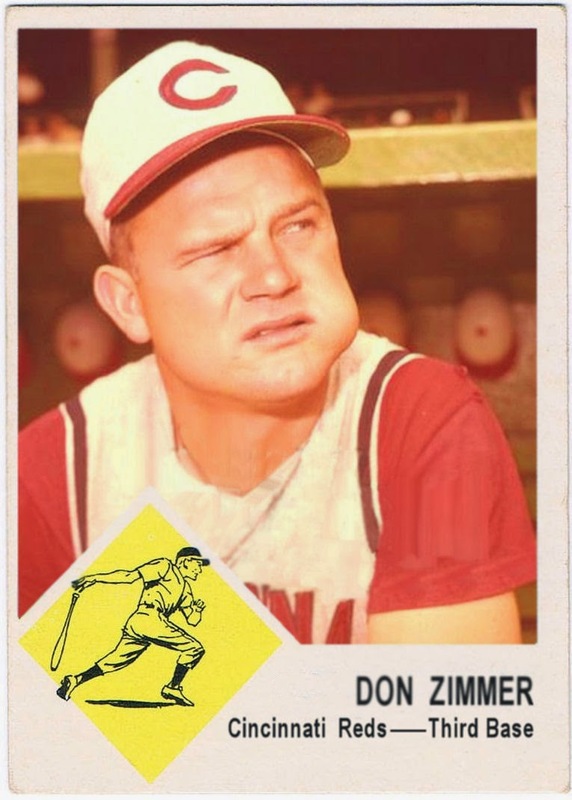 Don Zimmer was baseball. He was married at home plate to his high school sweetheart before a minor league game. 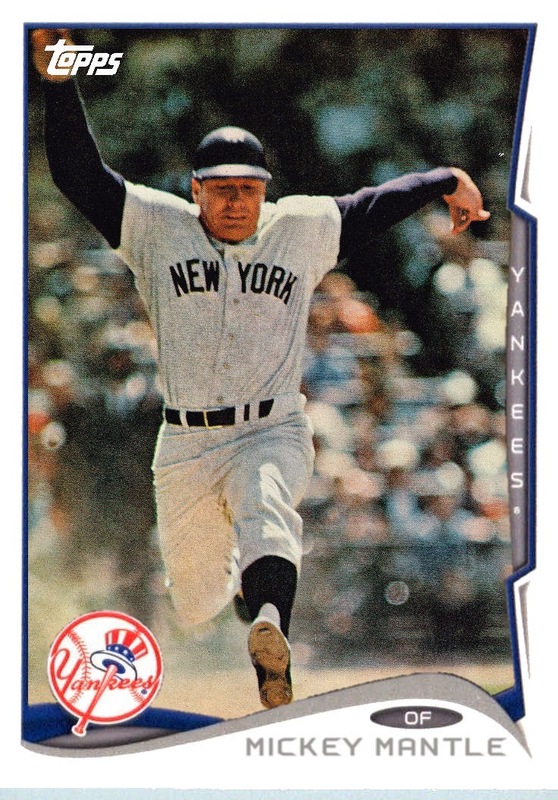 He began playing professional baseball 1949 in the Brooklyn Dodgers farm system. He played Major League ball from 1954-1966. He played in Japan in 1966 then became a player manager in the Cincinnati farm system in 1967. He has been a coach or manager right up until his death last week at 83. 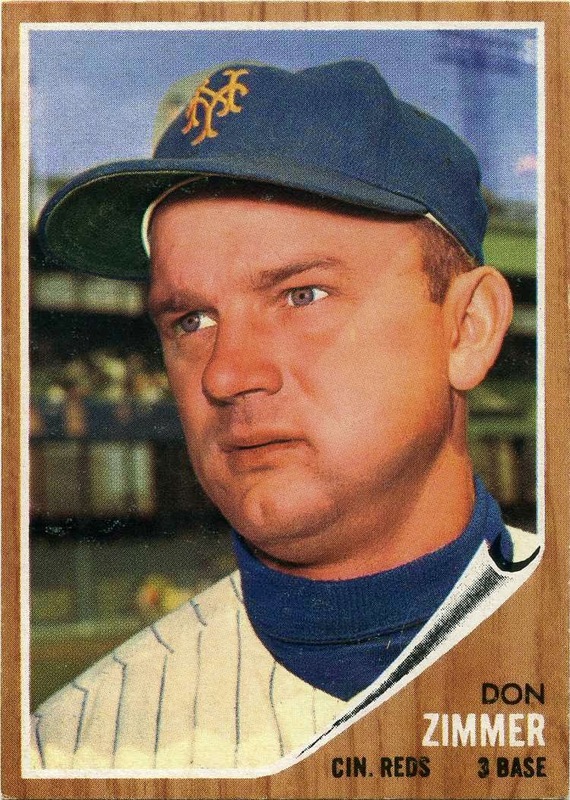 In 1962 Topps used a photo of "Popeye" wearing a Mets uniform but listed as a Red. Zimmer only played 14 games for New York in 1962 before being traded to Cincinnati. In January 1963 the Reds traded Zimmer to the Dodgers. Topps once again used an airbrushed photo of Zimmer in a Mets uniform. Although the Reds traded him before the start of the 1963 season, I decided to have his 1963 Fleer card depict him in a Reds uniform. Mainly because I have never seen a card with him as a Red. 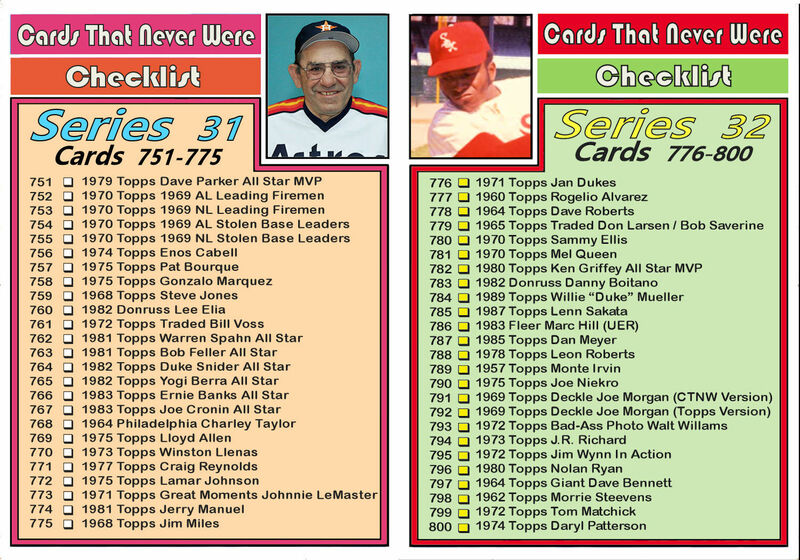 I modified another "Tall Boy" for my 24th series of card that never were. 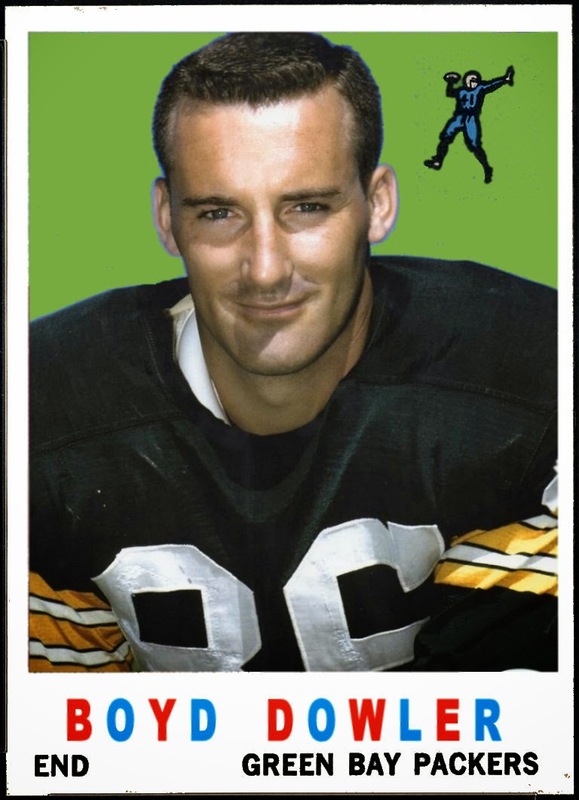 This one is from the 1965 Topps Football Set. 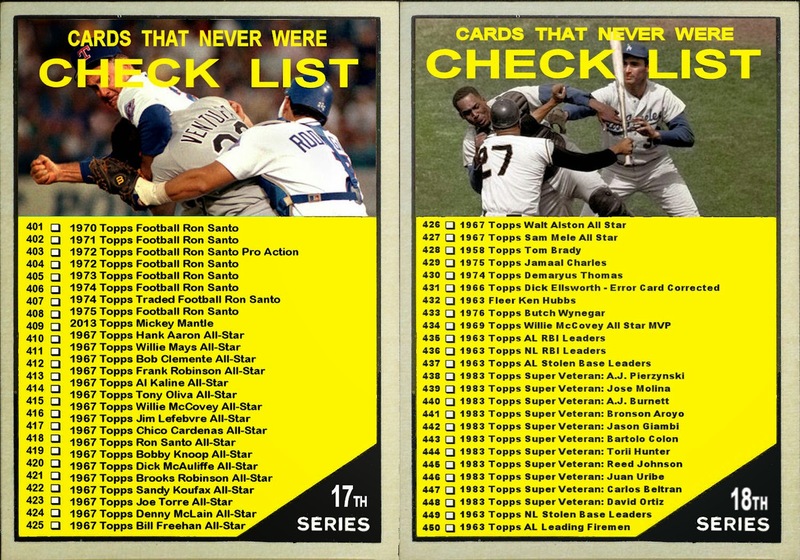 To see all the cards from this checklist in one place as well as those from the previous checklist click here. 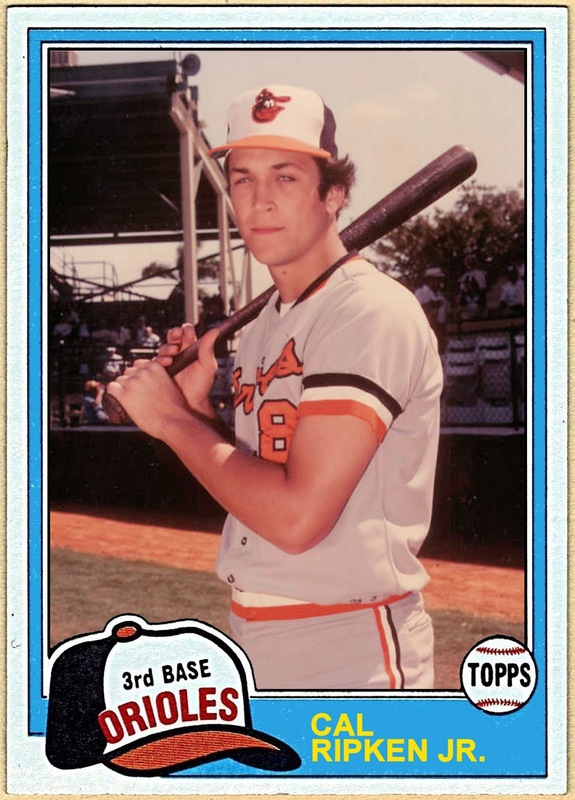 Cal Ripken made his debut on August 10, 1981. He had no plate appearances but scored the winning run. In the bottom of the 12th, Ken Singleton doubled against Kansas City Royals pitcher Renie Martin. Cal Ripken came in to pinch run. After an intentional walk to Eddie Murray, designated hitter John Lowenstein drove a walk-off RBI single to right field. The Orioles beat the Royals 3-2. 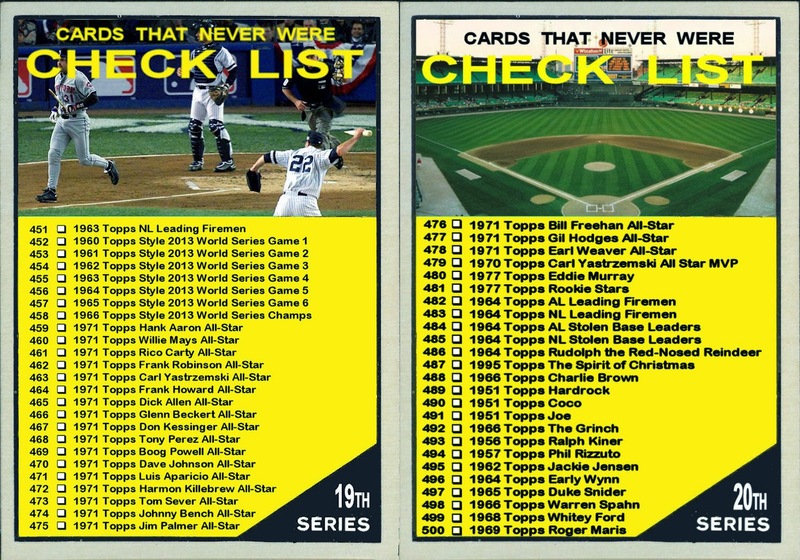 The Trading Card Database has over 12,000 cards listed for Cal Ripken. Finding a card that wasn't made of him is nearly impossible. 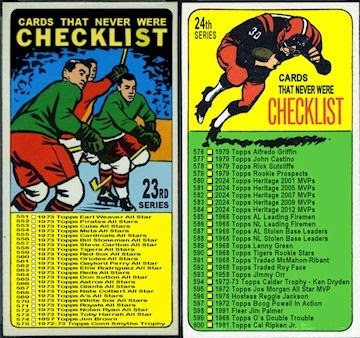 Nobody would expect a late season call-up to have a card in that season's set. 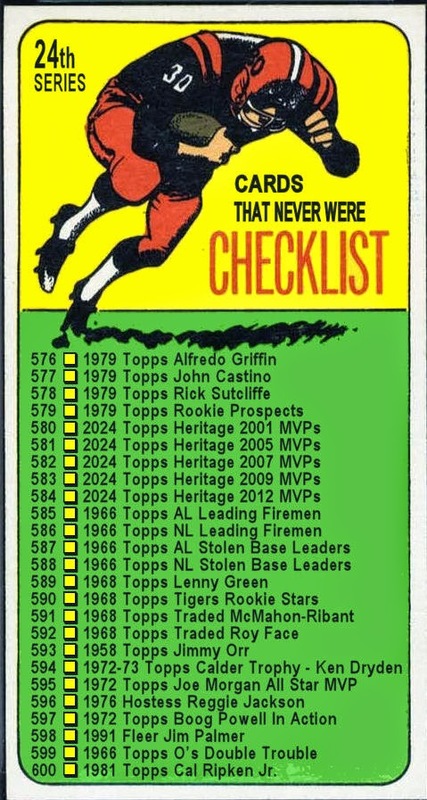 Then again, no list of Orioles greats would be complete without Cal Ripken. So I cheated. Just a little. At #2 on my list is a 2 for 1. The Orioles were already a good team with 97 wins in 1964 and 94 in 1965. 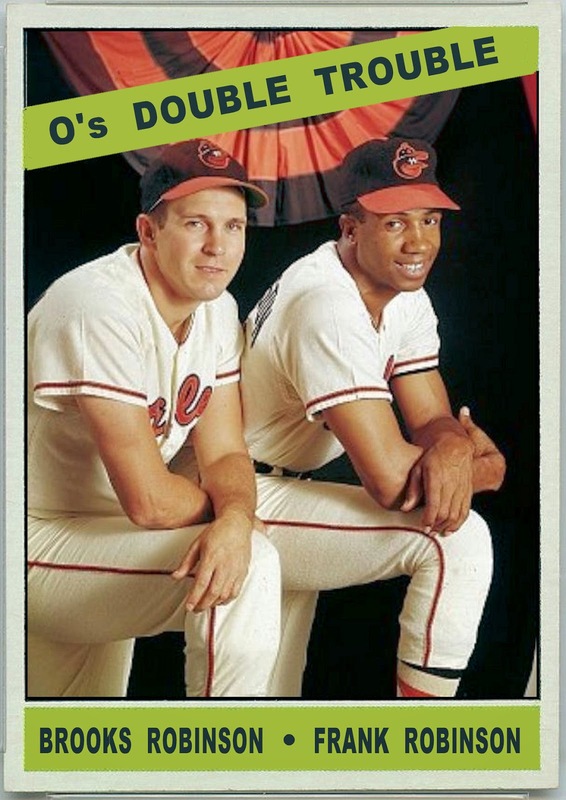 In 1966 the addition of Frank Robinson seemed to be just what they needed. Frank had an MVP season, winning the triple-crown and the Orioles became World Series Champs. Batting 3 and 4 in the line up, the Robinsons set the tone early in the series. In the top of the 1st inning of Game 1, Frank and Brooks blasted back-to-back homers. The Orioles beat the Dodgers in 4 straight and Frank Robinson was named the World Series MVP.